Name meaning: Name was given to him by his previous owner. History: Simone was kept in a Mini Zoo Hot Spring, Tawau, in the south east of Sabah together with a male sun bear Along. They were surrendered to the Sabah Wildlife Department in early January 2016 and underwent quarantine at Lok Kawi Zoo. She was fed with rice and fruits. Personality:Simone is such a character. 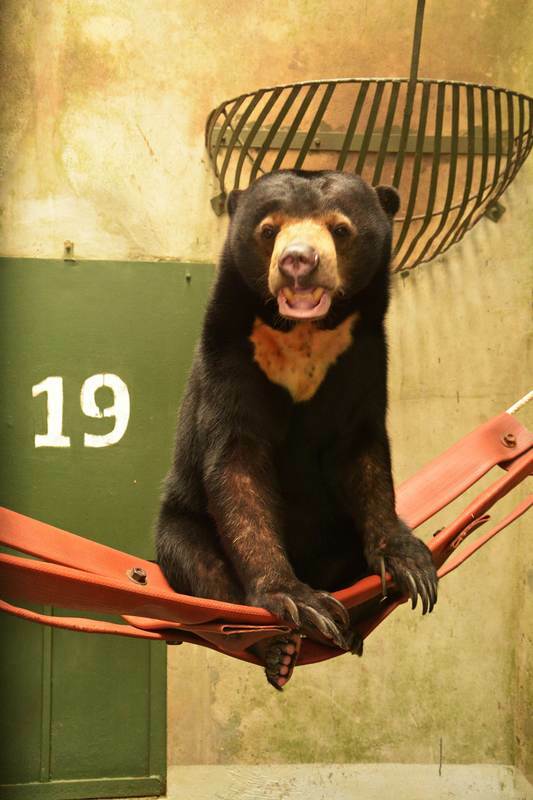 She became the most popular sun bear in the bear house with her affectionate behavior and enjoys lots of attention from people. Simone likes spending quality time observing the activities surrounding the bear house. Simone can be found resting on the food tray or water container with an extremely inquisitive look and wants to be involved with everything going on at the bear house. She has mastered the art of posing for cameras - when she wants to. She mostly spends her time exploring enrichment items like fresh logs and green leaves. She likes digging and she does a lot of it with water and food as well at every opportunity! ADOPTION: Tradewinds Plantation Berhad is adopting Simone under the My Bear Adoption Programme.